With an opening line of “Even ice cream in Texas comes in taco form,” Food Insider has blown us away with their video on a food truck in Austin, here in the Texas Hill Country, called Taco Sweets. Their specialty is making waffle tacos in which to serve ice cream, and it’s drawing quite the crowd! Their popularity may have something to do with the fact that they serve unlimited toppings, but we’d like to think that the use of Blue Bell ice cream (a Texas-made favorite) also has a hand in their success. Food Insider did an interview with the co-owners of the food truck, Deshawn Scott and Jessica Wareham, both of whom have a background in the hospitality industry. Fruit loops, sprinkles, graham crackers, and honey coconut are just a few of the toppings they supply, which they say bring more fun to their business. Take a fresh waffle taco shell, scoop your choice of ice cream into the serving, and add the toppings (one of which included a whole chocolate chip cookie!). Two of Taco Sweet’s patrons were interviewed for Food Insider. 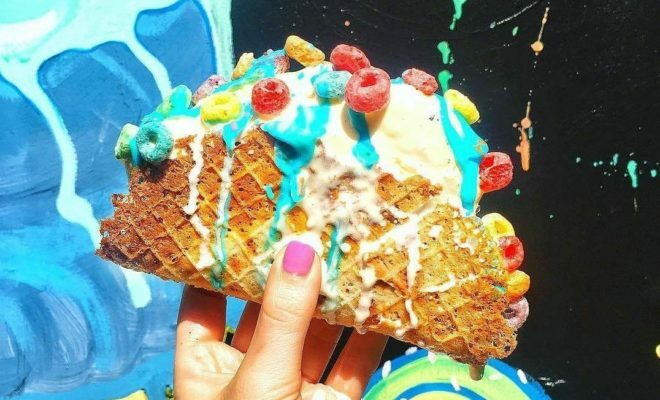 They say they found the Austin food truck on Instagram, and it looked so appealing to them that they set out to find them and try their waffle taco ice cream servings. Unique and really quite an inspired idea, Taco Sweets should be on everyone’s Texas Hill Country bucket list for food items you need to one day try!